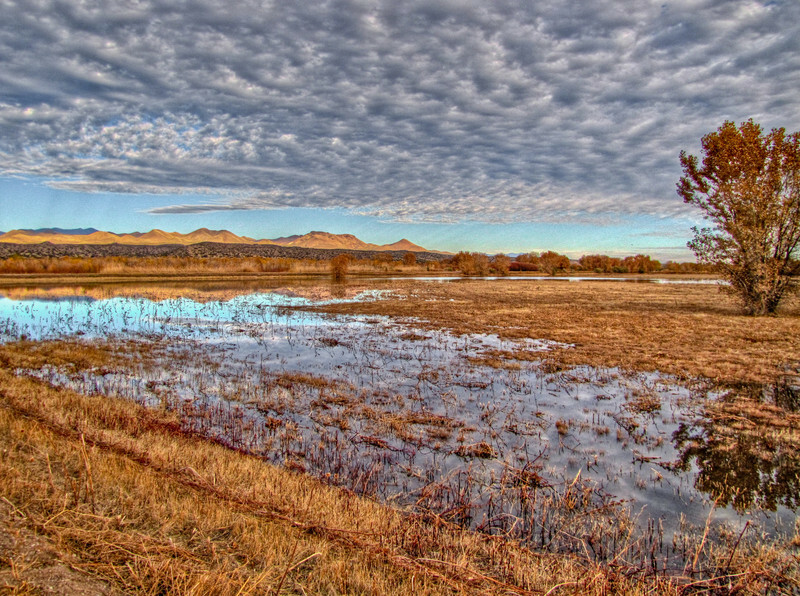 One of those dominating New Mexico, Bosque del Apache skies, and my Scenery for Saturday offering. Canon SX20IS @ 28mm equivalent. 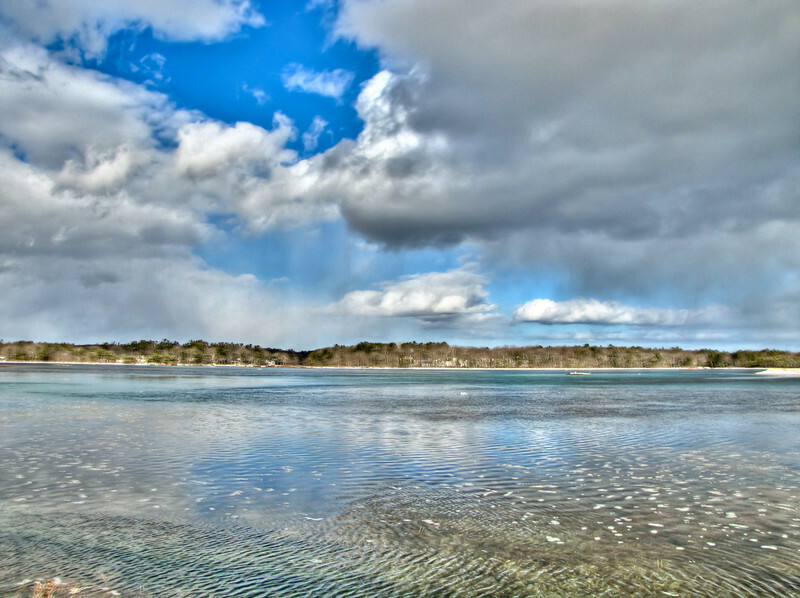 3 exposure HDR, auto bracketed around –2/3 EV, assembled and tonemapped in Photomatix, processed in Lightroom. And, just to the left. 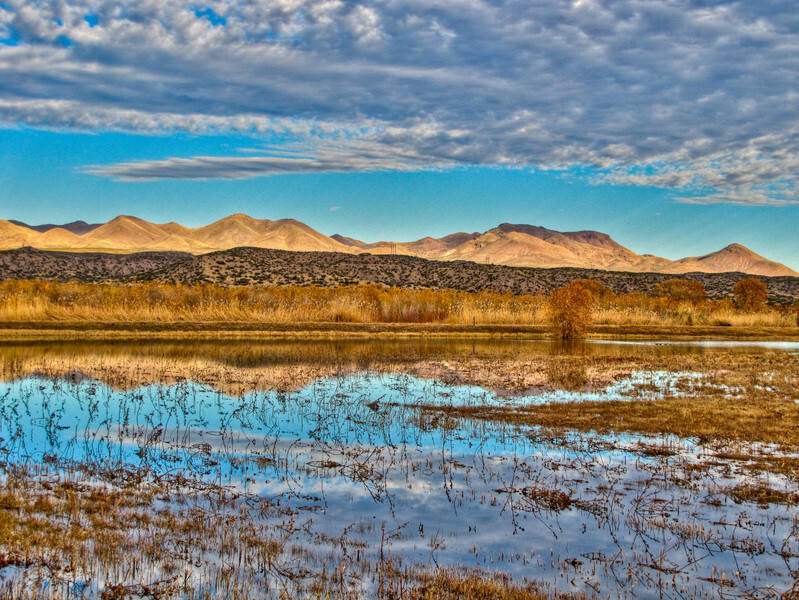 Time for some straight up Bosque del Apache scenery. 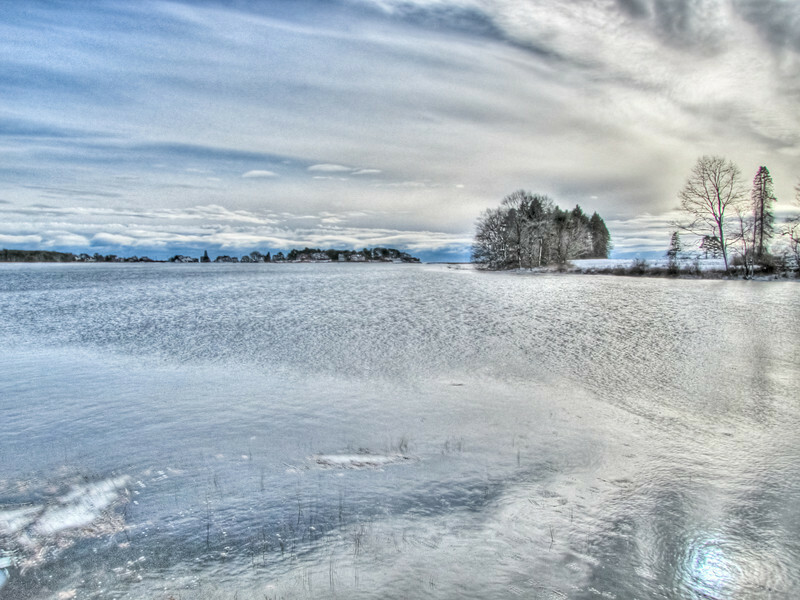 Mid-morning layered landscape HDR. The temporarily flooded fields are a Bosque feature, a way of managing where the geese and cranes feed. The geese, in particular, love to feed on the seeds and roots that flooding makes available. In this case either the field was newly flooded and the geese had not discovered it yet, or it was flooded long enough already that the geese had eaten everything they could find. Still…it adds the mirror layer to the landscape. Three exposure HDR, Canon SX20IS at about 70mm equivalent, autobracketed around –2/3 EV exposure compensation, assembled in Photomatix Pro using the Lightroom plugin and final processed in Lightroom. 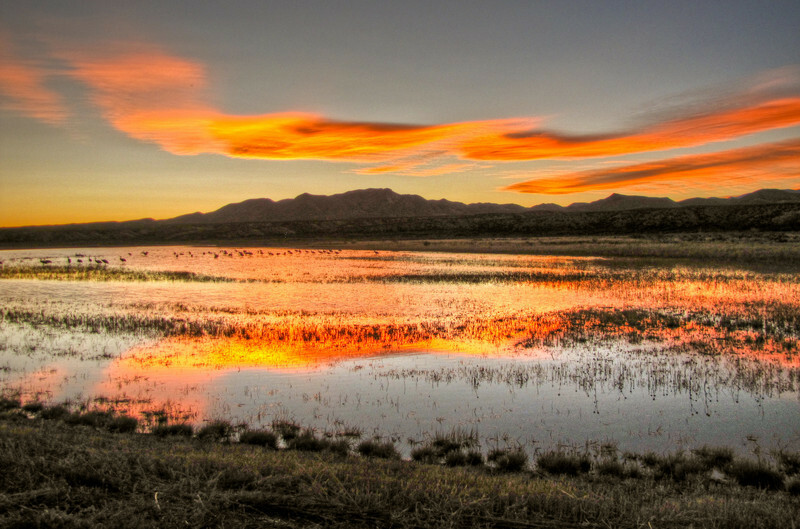 Bosque del Apache Sunsets can be spectacular (see last Sunday’s post), especially if you are where the Cranes and Geese are coming in to roost for the night. At some point in the process I stopped shooting the sunset itself and started trying to catch cranes as they passed in front. 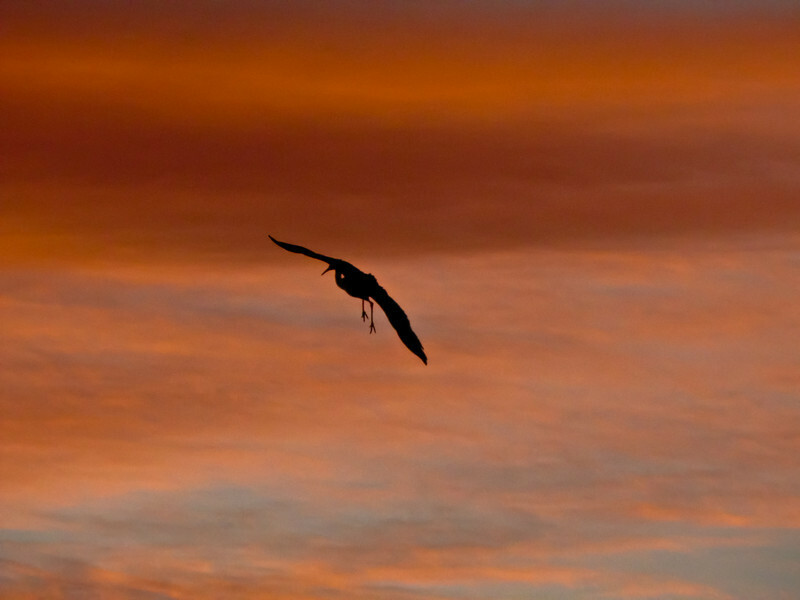 This shot was intentionally exposed for the silhouetted crane and the amazing colors of the sky. Canon SX20IS at about 500mm equivalent. f5.7 @ 1/640th @ ISO 800. Sports program. Processed for intensity and silhouette effect in Lightroom. Chromatic aberrations corrected and noise reduced. And, for my Sunday thought: sometimes all we can see is silhouettes against the persistent glory that illuminates our world, at least to the eyes of faith. And sometimes that is all we need to see. A speck of present life, even in silhouette, provides the perspective we need to face the future with confidence. But maybe that is a bit much to hang on a crane against the sunset? 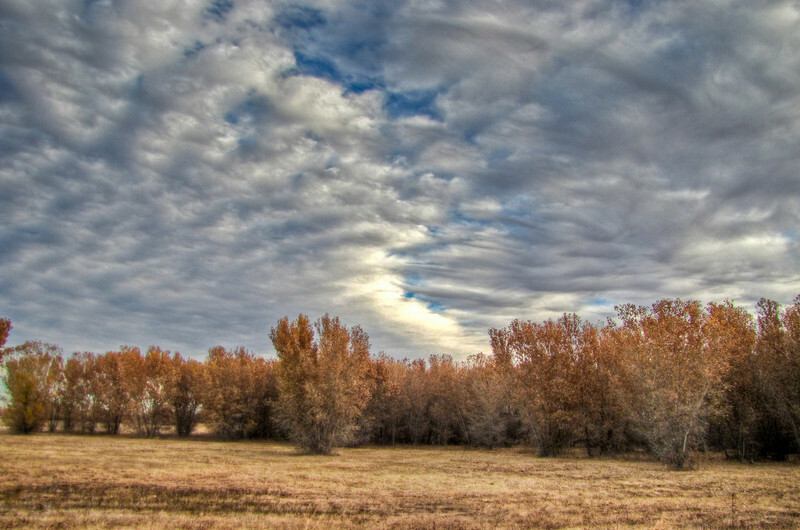 A frosty morning at Bosque del Apache NWR, with amazing clouds. 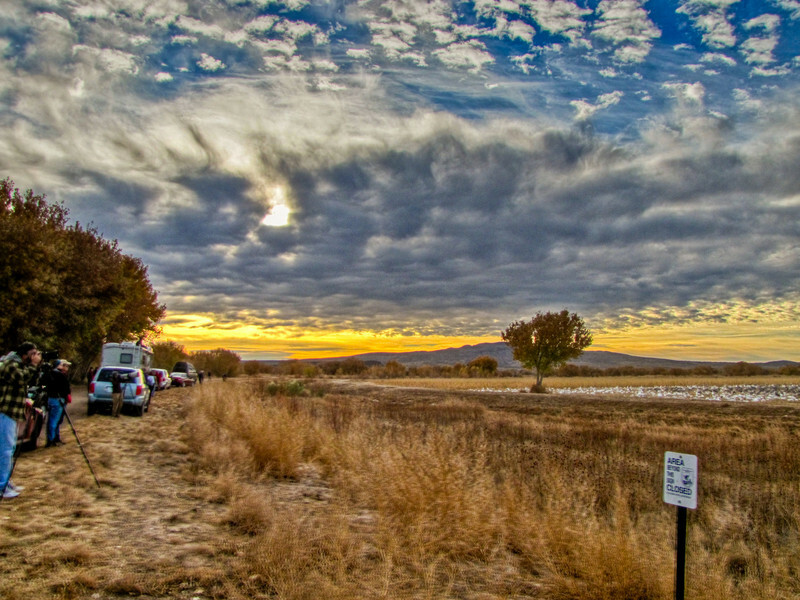 This is a three exposure HDR, only possible with people in it because these folks were so intent on photographing the geese and cranes in the field in front of them that they did not move at all. One of my commenters on a listserve (yahoogroups) that I post to objected to my leaving the photographers in what is obviously a picture of the sky. I think the tension in the photo, and what caught my eye as much as the clouds, is the fact that the watchers are so intent on the geese and crane show in front of them that they are totally oblivious to the show happing overhead! 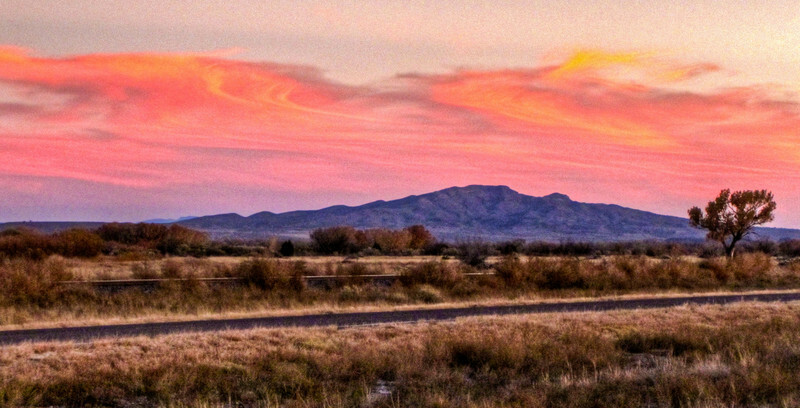 I went out after my day of work manning the ZEISS booth at the Festival of the Cranes at Bosque del Apache National Wildlife Refuge near Socorro NM, to digiscope Prairie Dogs in the last light of early evening, but the PD town was already closed down for the day. There was not even a single sentry on guard. So I headed back to town and supper. Of course I had to pass right by three flooded fields where the Sandhill Cranes come in for the night, right at or around sunset. And, on day like yesterday, the sunset itself is a show. I stopped and parked and waited. As the sun sank, the parking lot filled with folks who had the same idea. During the festival, sunset parking is at a premium anywhere on the refuge, and they actually take buses in to particularly choice vantage-points otherwise inaccessible to the public. People pay $5.00 to ride the bus. What you have here are three HDR shots: southwest in line with the sun, north along ridge that hides the mountains behind, and southeast where a larger mass of clouds behind the mountains took the color. The top shot is the last I took, just before the color died, when it was at its most intense. I find it hard to believe that there are people anywhere who would not be moved by such a sunset, with or without the spectacle of the returning cranes. Such awful, such awe-filled, beauty in the fire in the sky at day’s end…there are no words for what it says to our souls…but there is no doubt that it speaks. 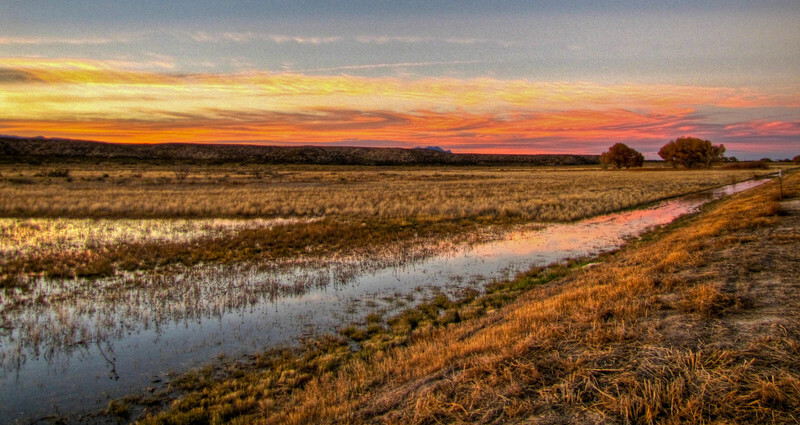 I am not sure what the Sunday thought is in the Bosque sunsets, but I certain it is there. Being there, along the dyke by the flooded field, and knowing that people were gathered all over the refuge to witness the same sight, with the air filled with the “music” of the cranes and geese, as the sky colored and as the color died, was very like being part of a worshiping congregation. I know who I worship, and I find it hard to believe that in those moments, we aren’t all, whether we acknowledge it or not, caught up in the same act of worship. Our awe may be as variously colored as the three images above, but it is the same awe, our birthright and our heritage as human beings…children of love. Canon SX20IS. Three exposures per image, auto bracketed at minus 2/3EV, assembled and tone-mapped in Photomatix, processed in Lightroom.